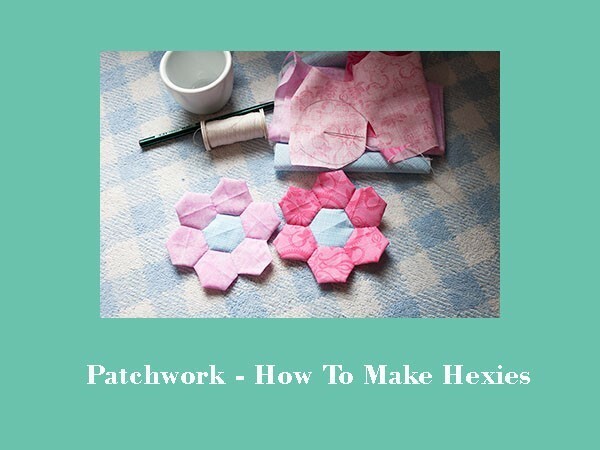 If you love to make patchwork, learning how to make hexies is a good idea, today I’ll share you a new way to make them that is easy and relaxing, you’ll love to make them for many project!. This time I will show you how to make one flower with seven hexagons, one for the center in one color and six for the petals in a different color from the one for the center. 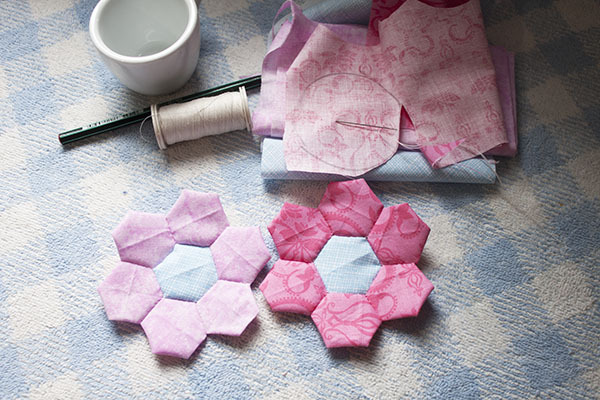 Today’s tutorial is the first part to make two flowers with hexagons, the second part will be in the next blog post to make a pouch with two flowers made with hexagons, so don’t forget to come back to check on the second part to make a cute pouch. 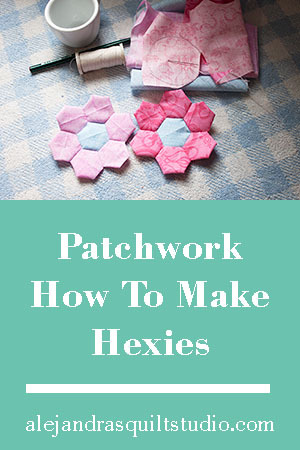 How to make hexies tutorial. I made a video (sorry, again in Spanish) but I will write down the steps you need to follow here in English, so you can follow the steps to make these two flowers. 1 To make the template trace a circle 2 1/2 ” on a paper and cut it out with the help of a pair of scissors. 2. Place the template on a fabric and trace the circle with a pencil or a marker for fabrics, make 6 circles on a fabric and cut them out with your scissors. Trace the template just one time on a different color fabric for the center of the flower, cut it out with your scissors. 3. Take the circle for the center and fold it in the middle, press it with your fingers, fold in half again and press it with your fingers to mark the center of the circle. 4. Open the circle, take one point of the edge of the circle and fold it to meet the center of the circle and press the fold with your fingers. You’ll see one edge folded on your circle and it has two points, take one point and fold it to the center and press it with your fingers. 5. Now, you have to folds in the center, make two little stitches on these two folds, don’t sew the front of the fabric. 6. Fold again the edge of the circle where the last fold is to the center, make another two little stitches to hold the fabric there. 7, Keep working this way, fold, press and sew until you finish, now you’ll have a hexagon made of the circle. Tutorial to make the flower. 1. Work the first hexagon with the directions above, the first hexagon should be the center of the flower. 2. Make the second hexagon with the same directions to make it, but don’t cut off the thread when you finish it, pass the needle in a fabric fold to get to one point of one of the sides of the hexagon. 3. Place the second hexagon face to face on the first hexagon, and make little stitches to sew together the two hexagons, make a knot at the end and cut the thread. 4. Make the third hexagon and place it on the first hexagon, face to face and sew together the two hexagons, just one side, open the third hexagon, and turn it to face the second hexagon, sew together the side of the hexagon that meets the second hexagon. 5. Work the rest of the hexagon in the same way until you finish sewing the last hexagon. The flower made with hexagons is finished, you need to make two flowers for this project. This time I just have here for you the tutorial to make the two flowers, in the next post I will share a tutorial to make a pouch with this two flowers on it, don’t miss it. To be the first one to know when the new tutorial is ready, follow me on Facebook, Instagram, Pinterest and now on YouTube. If you have any question about this tutorial, please leave a comment and I will reply to you shortly. I thank you for your time to read my blog and to follow me on Social Media. 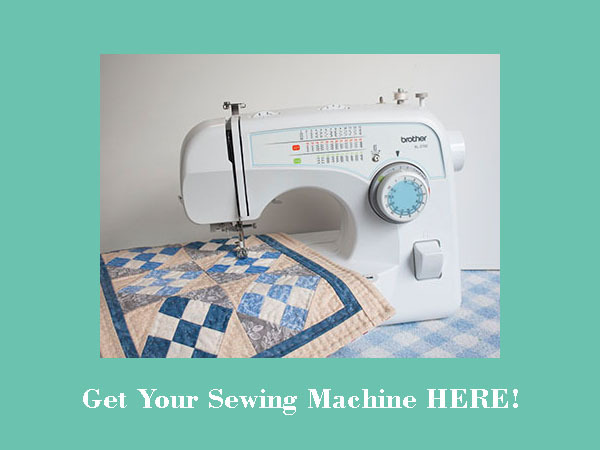 If you are looking for a small sewing machine to make your quilting and patchwork projects at home, you can take a look to some small quilting machines here, just click on the photo below. If you find this tutorial useful, you can PIN IT so you can find it later. 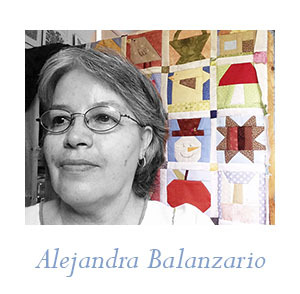 Un gusto grande tenerte de visita en mi blog, mil gracias por compartir el nombre de la puntada!